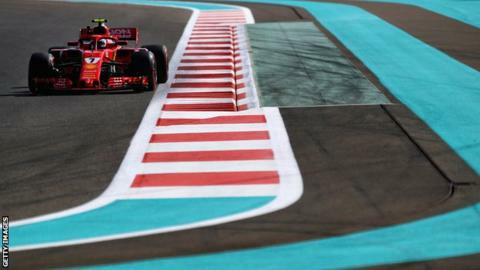 Max Verstappen led a Red Bull one-two in first practice at the season-closing Abu Dhabi Grand Prix. The Dutchman, F1’s form man in the season’s closing stages, was 0.454 seconds quicker than Daniel Ricciardo in his last race for the team. Mercedes drivers Valtteri Bottas and Lewis Hamilton were third and fourth but using harder tyres than Red Bull. Ferrari, spending time testing parts for 2019, were seventh and eighth: Kimi Raikkonen ahead of Sebastian Vettel. The Red Bull drivers were the only ones in leading teams to run a second set of the fastest hyper-soft tyres, which are fast for one lap but quickly lose grip on a longer run. Mercedes and Ferrari both ran the hyper-soft early on but then switched to harder tyres, Bottas setting his best time on the super-soft and Hamilton on the ultra-soft. Bottas also ran wide twice when doing his runs on the harder tyres. Hamilton is running on Friday the engine that he used in the last race in Brazil, and which at one point there the team felt was within one lap of failing. Mercedes said the problems were with the variable valve system and that settings were changed during the race to “contain the risk of failure/maximise performance”. The team added they have “made hardware changes outside the sealed perimeter and we are running that engine today”. Mercedes will analyse the engine at the end of Friday’s running. If it is not fine, they face the choice between running one that has already done seven weekends – and therefore would be over its planned life – or fitting a new engine. Elsewhere, Sauber’s Marcus Ericsson had a spin at Turn One, damaging his front wing in a light impact with the barriers in what will be his last race before a move to Indycars next season. Renault’s Carlos Sainz also had a spin, lightly touching the barriers in Turn 19. And Fernando Alonso, whose illustrious career ends this weekend, ran wide at the penultimate corner and ended the session 19th fastest. Alonso may yet test the McLaren 2020 car during the course of next season, team boss Zak Brown said on Friday, but the Spaniard confirmed his intention at the moment is not to return. Alonso said: “Right now it’s difficult to think about coming back but the door is not closed. The first reason is I don’t know how I will feel next year. I’ve been doing this for my whole life. Alonso will race at the Indianapolis 500 with McLaren, as well as completing his work in the 2018-19 World Endurance Championship season with Toyota, and says he will do other races, too. Meanwhile, there is an off-track dispute between Haas and Force India. Haas have lodged a protest saying Force India are racing a car they did not design, which is against the rules. But Haas immediately objected to the new entity being allowed to keep the old one’s rights to prize money, saying if a new team could earn a specific part of the prize fund immediately, then Haas should be entitled to it as well, rather than having to comply with a rule that says teams can only earn that tranche after finishing in the top 10 in two of the previous three seasons. Their complaints have been disregarded by the FIA and F1, and this protest is Haas’ latest attempt at redress.